Hi everyone, it's Laura, and I wanted to share with you a little gift idea I came up with for some of my friends and coworkers. It's quick and easy (my signature style LOL! ), and really fun! I love the idea of giving gourmet gifts to friends, but the problem is I don't do gourmet. Honestly, I can barely cook and baking...well let's not go there. So here's my solution for a fabulous "gourmet" gift. I purchased a large can of Tim Horton's French Vanilla Cappuccino, and I divided it into 6 Spa Bottles from Taylored Expressions. I added my own little touches for packaging it all up nice and pretty, and now I can give a little gourmet gift to each of them! The bottle and bag were very simple. 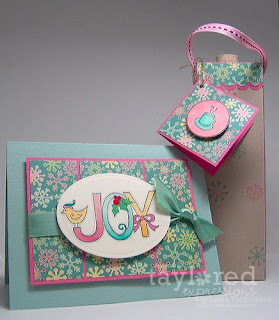 I used the stamp set Sweet Indulgence on both; the little coffee cup was just so perfect for this! For the bottle, I stamped the little coffee cup inside the round sentiment, and punched it out with the 1 3/4" circle punch. I coloured it with Copic markers and adhered it to the bottle. I added some ribbon around the neck and that's all. The gift bag was super easy too! I modelled it after the wine bottle gift bags...because, don't the Spa Bottles remind you of little wine bottles? It's really a 2-4-6-8 box that is quite long! I measured a square that was 8 1/2" square, and scored a 2", 4", 6" & 8". The you turn it once and score at 2". Cut out the little 2"x 1/2" piece in the corner, then cut along the scoring lines up 2" to meet the horizontal score. I used red line tape to adhere it, and decorated it with snow flakes from Wings of Joy, and a strip of designer paper from the Christmas Key Ingredients kit. I added a little tag with the instructions to the little bag, so my recipent can start enjoying their little gift right away! Of course I had to make a Christmas card to go with the set. 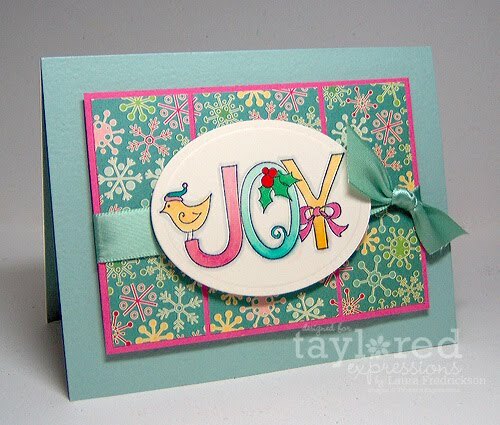 I had started with the intention of working with Taylor's Sketch Challenge #92, but ended up centering "Joy" because I couldn't make it work since the image was quite large. The stamp set is Wings of Joy again, and it's stamped on Choice Buttercream and coloured with Copic markers. All the paper is from the Christmas Key Ingredients along with the satin ribbon. The image was cut to an oval with the large oval Nestability, and popped up on dimensionals. Quick and easy! How fun is that? I love the little gift bag, it's so perfect for the potion bottle, and just makes it totally fun to give. What a WONDERFUL idea!!! 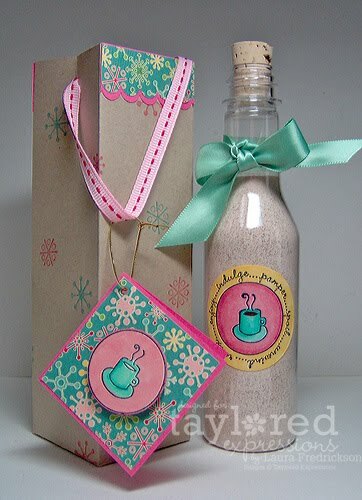 LOVE how you packaged the spa bottle and YUMMY Timmy's coffee...can't get that where I live now! Such a perfect idea for the bag and spa bottle! I love this little gift set!! WOW...Really nice card. Loved it. I really liked the idea of the spa bottle and the custom made gift bag. Very nice. Oh Tim Horton's French Van Capp! YUMMY! I am soooooooo going to use this idea my friend! LOL! GREAT gift set for sure! great little gift - love the 'wine' bag scaled for the bottle - thanks for sharing! !